Maybe i was expecting too much of this salon de thé, i don’t know, but i must beforehand tell you that the review is gonna be quite harsh. 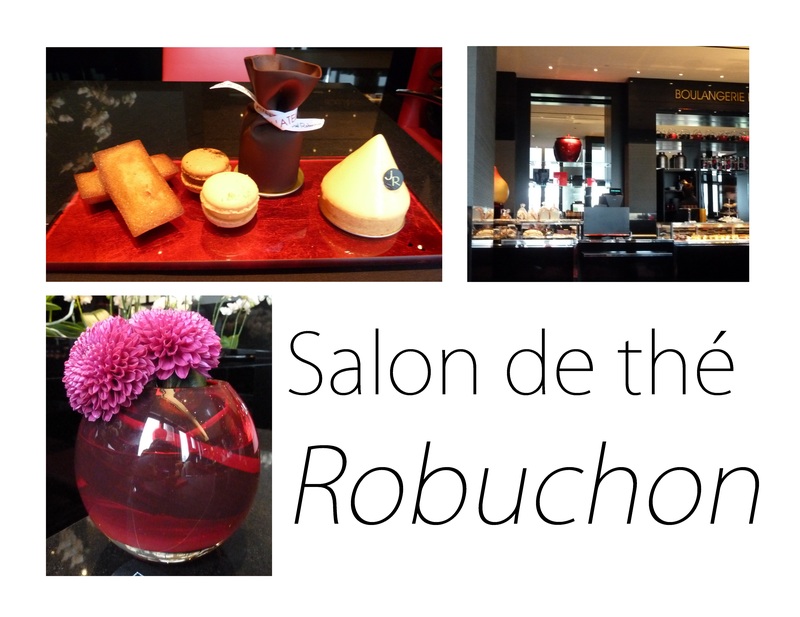 After all, Robuchon is a cook, not a pastry chef, i might have forgotten that on my way… What a big disappointment. I won’t go there again. The set for 1040 TWD, includes 2 pastries, 2 macarons, 2 drinks and 2 madeleines. 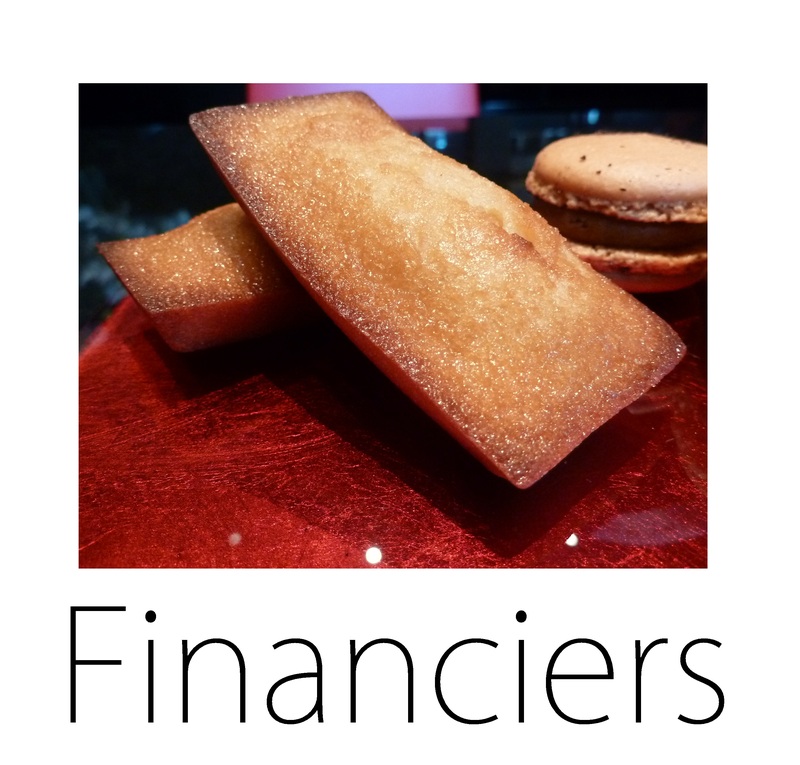 Or so they said: i had financiers instead of madeleines…hum they should do what’s written or at least inform the customer before: First mistake. On the website it’w written they have Coffee Religieuse (the main reason i came), and they hadn’t (not because it was already sold out, just because it wasn’t the season anymore): Second mistake for a salon de thé of this level. It takes 2 minutes to change your menu on your website. So i chose a tiramisu and a lemon pie, with 2 espresso. What’s nice is that they ask you if you want your 2 espressos at the same time or one after the other. Espresso, like in the restaurant, they were nice and it’s always a pleasure to have nice coffee once in a while here. The lemon pie. I think the jelly layer they use to protect the cake (i don’t know its name) was too thick, it spoils the lemon custard. This was nice, but i would have prefer it with a stronger taste. Then you had a mousse inside. It was nearly tasteless. The little insert of lemon was nice, that was the only thing that had a lemon taste strong enough to call the pastry a lemon pie. And the pastry dough was again tasteless. It usually have some almond taste, or a taste, but here it didn’t have anything special. Maybe because it wasn’t cook enough or because the cake was too cold? I don’t know, but the lemon pie wasn’t strong enough. The tiramisu. Nice in look, but so not convenient to eat. The chocolate layer was too hot, so the chocolate was soft. What was unacceptable was that my pastry was damaged on the top. It either means the pastry was not well-conserved since it was made, or that they had a problem while tempering the chocolate. For the price, in both way i can’t tolerate it. The mascarpone cream was light, but again, bland. Concerning coffee, it had some taste, the biscuit was well impregnated, but i would have expected a stronger coffee taste. And the chocolate made it difficult to eat it, so you couldn’t eat all the layers at the same time (which is bad, as if in a mille-feuilles you couldn’t eat all the layers at the same time). There was too much mascarpone for the coffee, that’ why the overall was not strong enough. My mother’s one is a way better, and i’ve tasted a lot better one elsewhere. The financiers: too dry. Nothing else to say. The cannelé. OMG, what a horror. Where did they see that it had so many blisters after being cooked? There was definitely a problem in the way it was heat: the inside was nearly not cooked, while the outside was too cooked. And i don’t talk about the Rum. Where was it? A Cannelé is based with rum, and here the rum was really behind. You could taste it, but i had to focus on it, that was the opposite of the one i had in L’Assiette, what was a way better, or even my mother’s ones. This was a total failure for me. Luckily for them, they have awesome macarons. Coconuts and Violette one were my favorite. The Coffee one is ok, and the mango not strong enough for me, but maybe it was too cold again (cold kills taste, that’s horrible, you can’t eat pastries if it’s too cold).But they’re even more expensive than Pierre Hermé’s macarons that are the most expensive of Paris, so don’t make me laugh, 80 TWD (2 euros) for a macaron, that’s only because it’s called macarons that they can show those prices. So as you saw, i was really disappointed. 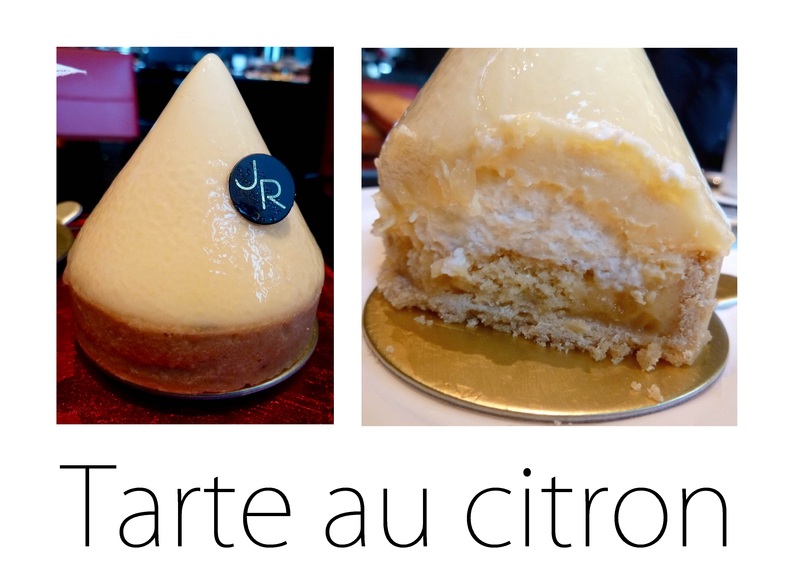 Everything is in the design, the look, but the taste is far behind good pastries in France. Sadaharu Aoki’s pie was a way better. The breads aren’t worth neither compared to Lalos as i already tried them in the restaurant. If you want to show off around foreigners and wealthy people, go there, but if you’re interested in good pastries, well, go to the basement instead and eat at Sadaharu Aoki. That’s all i can say. 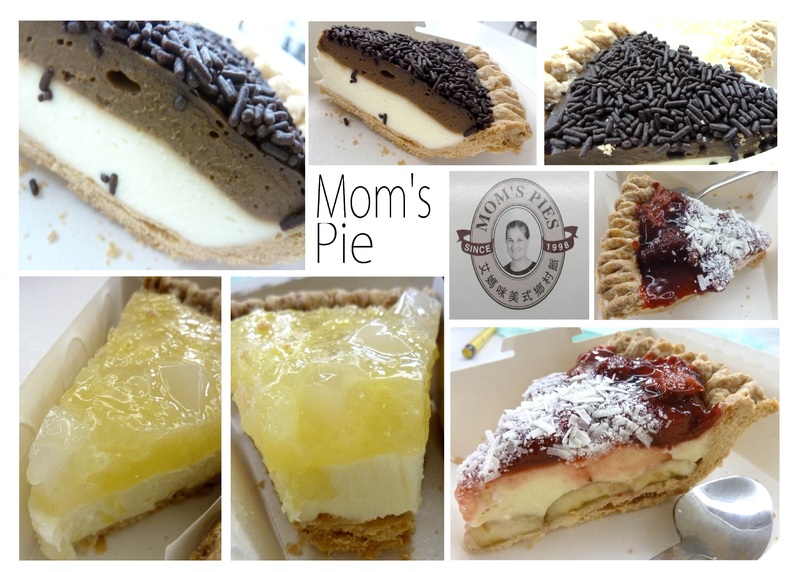 This is an average pastry shop with of high quality pastries prices. 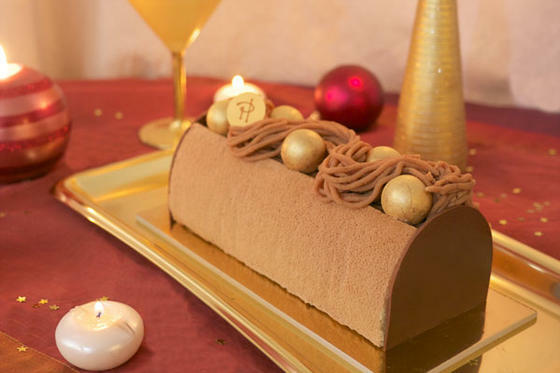 I saw this dessert last time in the 2nd bakery and i found it strange, so i decided to buy it on Thursday (because that’s the only day i can see it. They don’t bake the same things everyday…). That’s really a big pudding on a melon bun. Quite strange. The pudding isn’t really good and too hot i think. And what’s even stranger is that the caramel layer isn’t a part of the pudding, it’s as if they had added another layer after. The melon bun is the one i had once alone, but i don’t think that the 2 flavors pudding/melon go well together. The dessert in itself is also too big for a dessert. Not worth taking it again. Why would i wrote about a german cake if i’m in Taipei? Well, Taiwanese do like to put western attribute to their cakes, so here is a Taiwanese version of a so called “German cake”. However i doubt that’s really the case, as their “French breads/pastries” look nothing like French. And i asked some German girls if they knew about it (since i’m in an international environment, that’s easy to check), and it seems that they don’t. Anyway, back to the cake itself. The dough is really big here, and too dried to be good. The cream/flan is heavy, but creamier than the usual. However, again, it lacks taste. And then you have the jam, that mixed itself with the cream quite well. Overall: to heavy and creamy, no subtlety at all. I won’t make a real review about this because it’s been more than 2 weeks since i ate this and i don’t remember really well everything. I just know that the “mille-feuilles” was good. The chocolate one was really filled with dark chocolate, so it’s perfect for chocolate lovers. 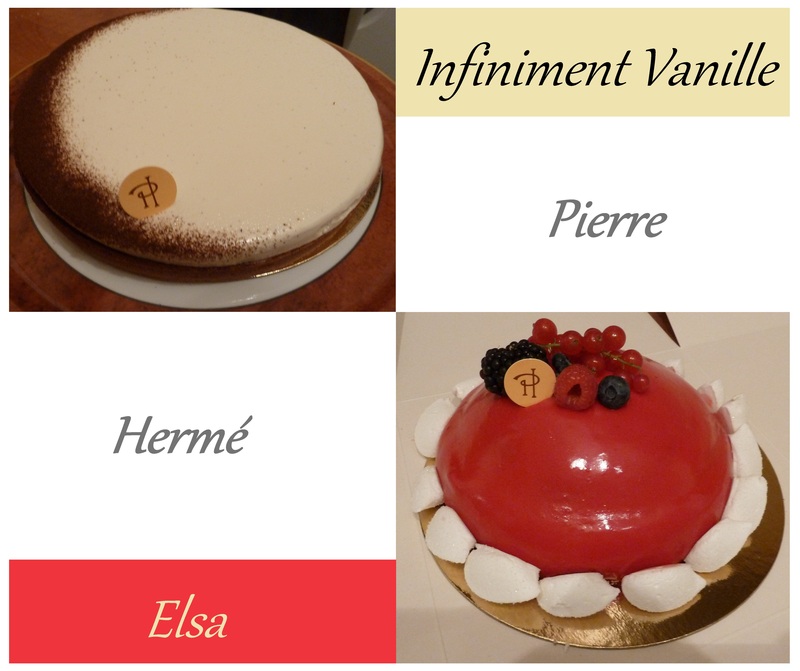 As for the infiniment coffee pie, i prefered the vanilla one. The coffee isn’t strong enough for me in this pie, but i really like the different layers and the game of the textures. You can eat it as an appetizer or as a starter with lettuce. For this dinner, I considered it as an appetizer. I took the recipe from a blog, but unfortunately i can’t remember the name. So if you know, please tell me because i don’t like writing recipes without saying who is the real author. First, you gotta prepare the onion confit. For that, cur your onions in small slides and cook them in a pan with olive oil.Make them brown lightly then add the sugar, the raspberry vinegar, some salt and pepper. Cover and let it simmer on low heat for 30mn. Mix from time to time. Unroll your pastry, cut in square, make holes with your fork in the middle of each square that you dispose on greaseproof paper. Put your onion confit in the middle, add a slide of goat cheese, herbs, and pine kernel. Vous pouvez les servir comme amuse-bouche ou comme entrée avec de la salade. Je l’ai considéré comme amuse-bouche pour le diner. J’ai pris la recette d’un blog, mais je ne me souviens malheureusement plus du site. Si jamais cela vous dit quelque chose, dites-moi son nom que je puisse le marquer, je n’aime pas ne pas donner l’auteur des recettes. Coupez les oignons en fines lamelles, les faire blondir avec l’huile d’olive. Ajouter le sucre, le vinaigre de framboise, du sel, du poivre et laisser mijoter 30mn à feu doux. Déroulez la pâte, faire des carrés et les mettre sur du papier sulfurisé. 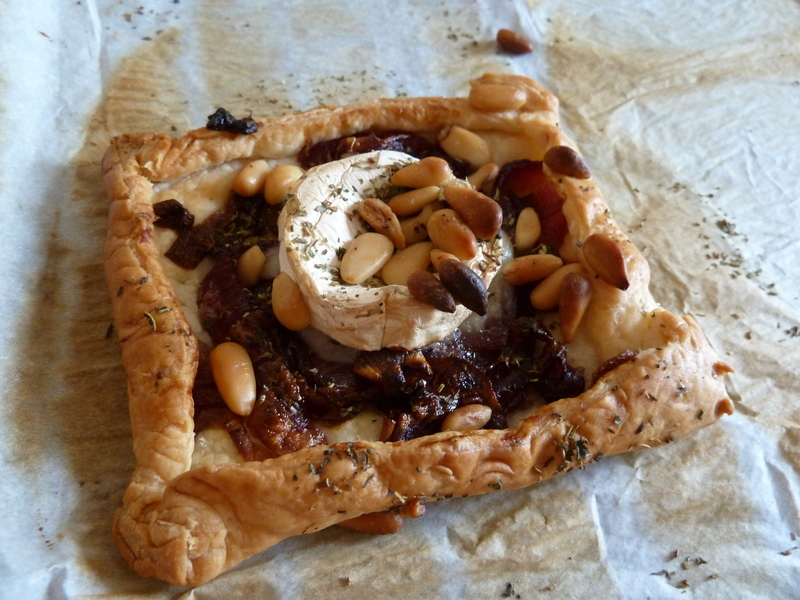 Piquer au milieu, mettre le confit d’oignon, une lamelle de chèvre, des herbes, des pignons, remonter les bords de la tarte. Mettez au four 15 minutes.